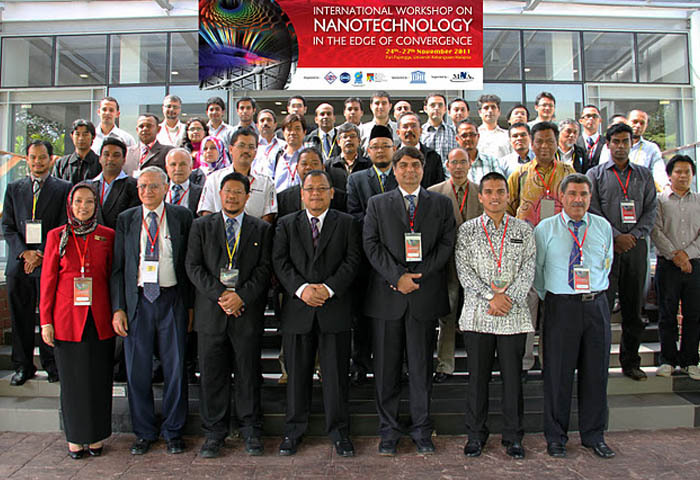 COMSATS co-organized the International Workshop on ‘Nanotechnology in the Edge of Convergence’, at Puri Pujangga, Universiti Kebangsaan Malaysia (UKM), Malaysia, on 24-27 November 2011, in collaboration with the Institute of Microengineering and Nanoelectronics (IMEN), Malaysia (host institution of the event), and the Centre for Science & Technology of the Non-Aligned and Other Developing Countries (NAM S&T Centre), India. The event was co-sponsored by the United Nations Educational, Scientific and Cultural Organization (UNESCO). 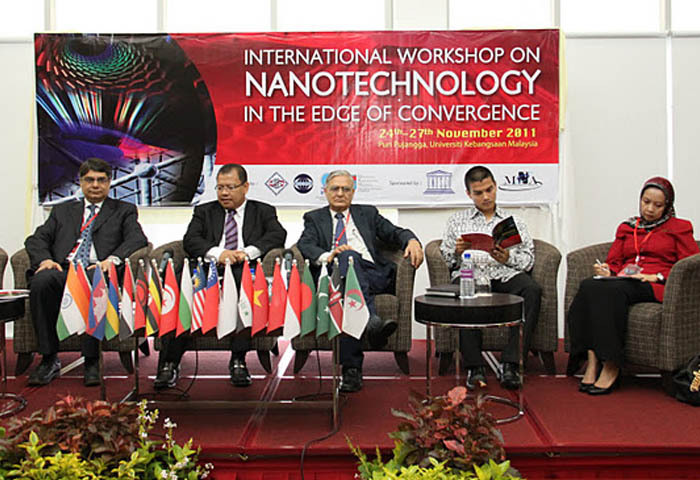 The workshop provided a platform for the participants belonging to various developing countries to: discuss recent advancements in the field of nanotechnology; exchange expertise and technical know-how in the field of nanotechnology; develop strategies for building a pool of scientists and researchers having adequate expertise in nanotechnology and for utilising recent advancements in the field of nanotechnology for socio-economic development; and encourage professional societies to develop a network to inform, educate and involve scientists working in this field. Another important objective of the event was to build and strengthen linkages among R&D organisations working in nanotechnology for effective South-South and North-South cooperation in this field. 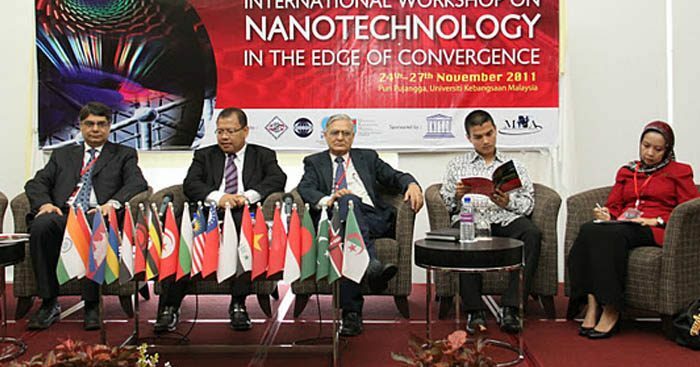 The event was inaugurated at Puri Pujangga, UKM, on N ovember 24, 2011, in the presence of Prof. Dato’ Dr. Burhanuddin Yeop Majlis, Director, Institute of Microengineering and Nanoelectronics (IMEN); Prof. Dr. Arun P. Kulshreshtha, Director, NAM S&T Centre, India; and Dr. Arshad Saleem Bhatti, Dean, Faculty of Science, COMSATS Institute of Information Technology (CIIT), Pakistan. Also during the inaugural ceremony, Prof. Dr. Halimaton Hamdan, Director, National Nanotechnology Directorate, Ministry of Science, Technology and Innovation, Malaysia, delivered the keynote address on “NanoMalaysia Programme and Way Forward’’. Brief remarks on the event were given by Mr. Mohd. Zulkifli Hashim, Executive Secretary, Malaysian National Commission of UNESCO. In her message read on the occasion, Prof. Tan Sri Dato’ Wira Dr. Sharifah Hapsah Syed Hasan Shahabudin, Vice Chancellor, UKM, highlighted the importance of nanotechnology as an emerging field of S&T that has a great potential to uplift the living conditions of a common man. Dr. Hapsah believed that the field of nanotechnology can revolutionize the major industries around the world, including, medicine, healthcare, pharmaceuticals, and computers. 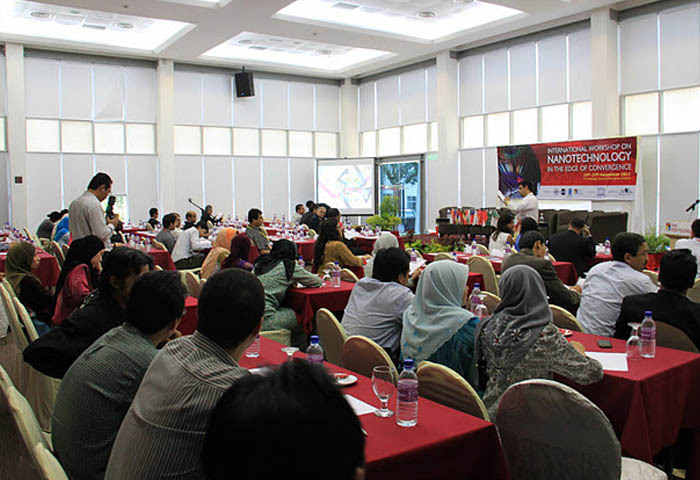 Prof. Dr. Burhanuddin considered the joint organization of the event as a platform to expand UKM’s network. Prof. Dr. Arun believed that the event will open new avenues of fundamental research and application oriented programmes in the developing countries. In his message, the Executive Director COMSATS, Dr. I mtinan Elahi Qureshi, appreciated the efforts made by the organizing committees of the event and hoped that the event would provide an opportunity to the academicians, researchers, scientists, policy makers and implementers, from various developing countries, to share ideas, expertise and knowledge related to the fields of nano-science and nano-technology. 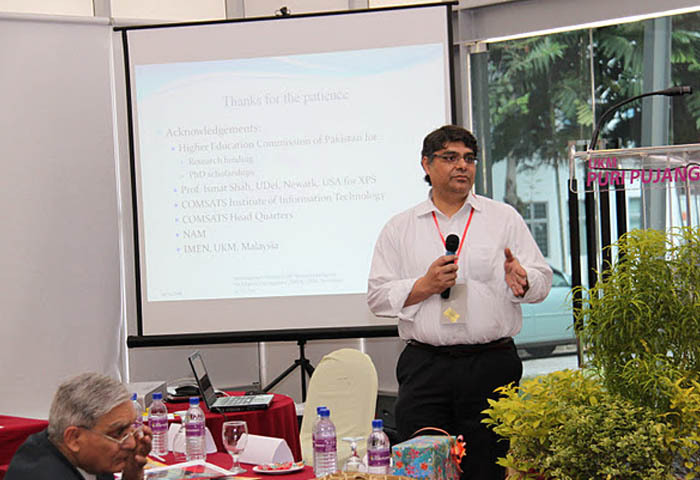 12 Malaysian and 25 foreign experts/scientists imparted training to 51 participants. The foreign speakers of the event belonged to Pakistan, India, Bangladesh, Bulgaria, Cambodia, Sudan, Tunisia, Kenya, Mauritius, Morocco, Nepal, Myanmar, Egypt, Indonesia, Vietnam, Uganda, Iraq and Malawi. The deliberations of the event were spread over 4 days and comprised 6 technical sessions and visits to UKM and IMEN. The event covered 36 presentations on the theme of the workshop. A Poster Presentation Session was also organised during the Workshop, in which nine posters were displayed by the Malaysian scholars. Subsequent to the Technical Sessions, Prof. Arun P. Kulshreshtha, Director, NAM S&T Centre made a presentation on ‘The Role of the NAM S&T Centre for South – South Cooperation in Science & Technology’. The deliberations and debates of the participating scholars resulted in the formulation of ‘Bangi Recommendations on Nanotechnology in the Edge of Convergence’ that were later adopted during the Workshop’s Closing Session.